Translation – He, whose devotion unto the Supreme Lord is as firm as the carvings upon a stone, whose lotus feet is as wish fulfilling as a touchstone, whose words are as authoritative as the Vedic scriptures – I offer my respectful obeisances again and again unto Narottama das Thakura. Translation – May Srila Narottama das Thakura’s gently smiling lotus face, which is replete with his merciful glance that absolves millions of sins of the surrendered souls, and the lustre of his extremely beautiful teeth shining from his enchanting lips, dance within my heart and grant me his service. Sri Narottama das Thakura, the son of Sri Krishnananda Datta and Srimati Narayani Devi, was born on the auspicious occasion of Maghi Purnima, in the year 1531 AD. Sri Krishnananda was the erstwhile king of the Gopalpur province of Rajshahi. Narottama das is an eternal servant of the Supreme Lord and he eternally serves as Champaka Manjari in Krishna’s Vrindavana pastimes. We seek the blessings and compassion of Sri Narottama das Thakura, before attempting to narrate some of his heart-rending pastimes. 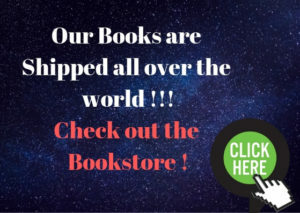 The readers are here requested to excuse any of our unintentional mistakes, as we are mere fools, who, not knowing our limits, are trying to delve deep into this esoteric well, to excavate the mesmerizing jewels that adorn the devotees of Sri Gaurasundara. As we already know, that when Sri Caitanya Mahaprabhu desired to travel to Vrindavana for the first time, He met His dear associates Sri Rupa and Sanatana Goswami at Ramkeli, in Malda (refer – ‘Ramkeli, Malda – The once-headquarters of Sri Rupa and Sanatana Goswami’). However this time, Mahaprabhu did not travel as far as Vrindavana and returned back only from Kanai Natshala (a place hardly 100 Kms from Ramkeli). The only purpose of His visiting Ramkeli was to bless and unite with His eternal servants Sri Rupa and Sanatana Goswami. Being intoxicated with the bliss of Harinama sankirtana at Kanai Natshala, Sri Caitanya Mahaprabhu repeatedly called out ‘Narottama! Narottama !’ The Lord was deeply overwhelmed with ecstasy and lost His external consciousness in the process. It is to be noted that Narottama das Thakura had not appeared in this world at that point of time. Understanding that a great devotee by the name of ‘Narottama’ would subsequently appear at that place, Lord Nityananda, Haridasa Thakura and other associates of Mahaprabhu, who were present, requested Lord Caitanya to kindly reveal the truth to them. Mahaprabhu then explained, that He had inaugurated His sankirtana movement at Navadvipa and had subsequently shifted to Jagannatha Puri, after accepting His sannyasa. All of these places were now completely immersed in waves of pure love. But He wanted to bestow His love upon Gaderhat (on the bank of Padma) as well. He expressed that He wanted to preserve this pure love of God even after He had disappeared from this world. 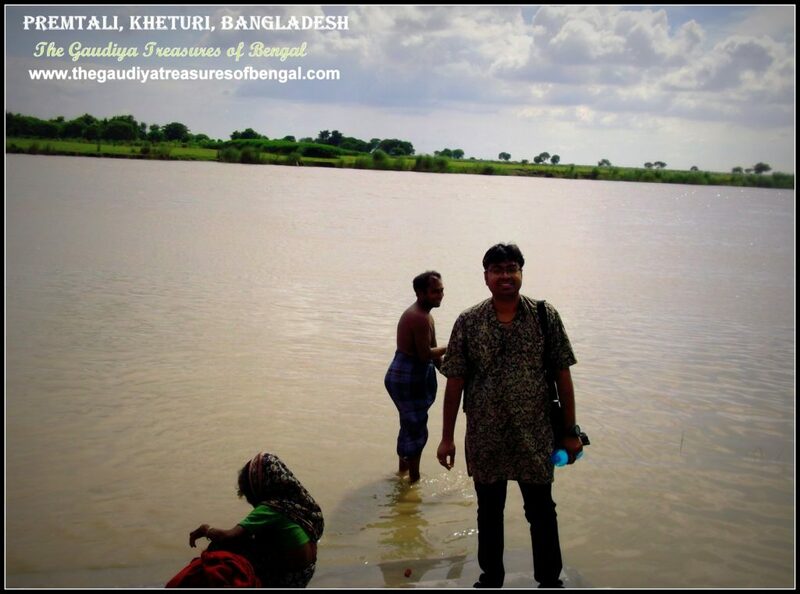 Thereafter the devotees along with Lord Caitanya began their journey to the other side of the river Padma. On reaching the banks of Padma, Mahaprabhu lost Himself in a fit of utter ecstasy. Crying out ‘Narottama! Narottama !’ He began shedding tears of love. Lord Caitanya then revealed to Nityananda Prabhu that He desired to preserve the same love that Lord Nityananda felt for Him, in the waters of Padma. That love which Nitai possessed for Gaura, with which He bound the Supreme Lord, the love that caused Nitai to roll over in dust and cry tears of ecstasy – Lord Caitanya wanted to deposit that same pure love in the waters of fortunate Padmavati. The next morning Lord Caitanya bathed in Padmavati along with His associates and performed sankirtana. They roared so loudly that their bodies began to shiver in ecstasy. The dancing became wilder as it progressed and thousands of people could not hold them still. During this sankirtana, the Lord repeatedly cried out ‘Narottama! Narottama !’. In the course of this pastime, river Padmavati became overwhelmed with this ecstatic love. Her waves surged and the waters began to rise, not being able to contain the pure love bestowed by Sri Caitanya Mahaprabhu. Within a short time, the villages were flooded and the people were astonished to find so much water when it was not even the rainy season. Mahaprabhu then instructed Padmavati to save this love and award it later to Narottama, who would appear at that place in the near future. When Padmavati enquired as to how she could possibly recognize Narottama, Mahaprabhu replied, that Narottama’s touch would make her more ecstatic. In this way, Padmavati could easily recognize this great personality. Padmavati then happily preserved this pure ecstatic love of God, for Narottama. 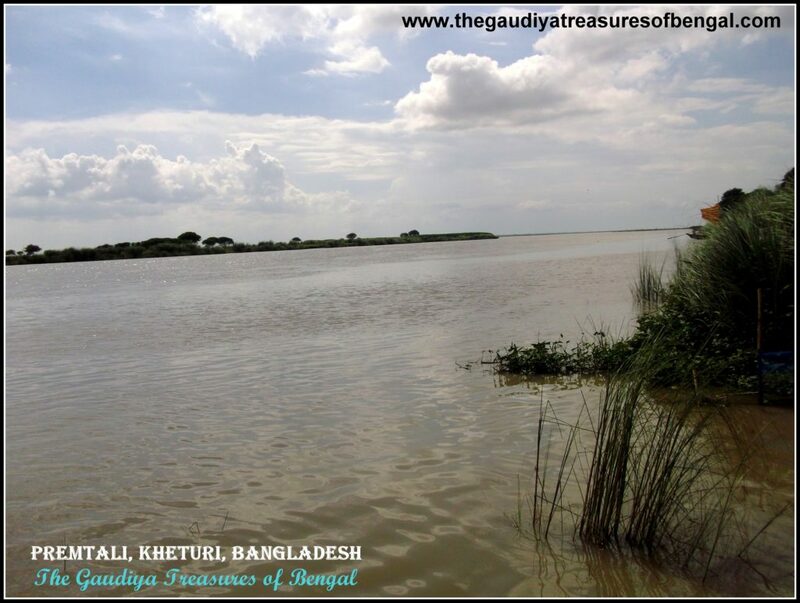 This place on the banks of Padma where this entire pastime had once taken place, came to be subsequently renowned as ‘Premtali’.The team from ‘The Gaudiya Treasures of Bengal’ is blessed to have visited Premtali and bathed in its sacred waters. It is stated in Sri Caitanya Mangala, that bathing in river Padma (the branch of river Ganga that flows through Bangladesh) is even more auspicious than bathing in river Ganges itself. Padma bestows pure love of Krishna upon one who bathes in her, provided that the concerned person has not committed any offense at the lotus feet of the Vaishnavas. Receiving Sri Narottama das as their son, King Krishnananda Datta and Srimati Narayani Devi became very happy and jubilant. Previously when Narottama das Thakura was in Narayani devi’s womb, an astrologer had correctly predicted that the child would become a great personality and shall be the cause for everyone’s happiness in the country. His presence will destroy all distress and inauspiciousness. Just after the prediction was made, a messenger arrived with a packet of ten thousand coins for King Krishnananda. Everyone became convinced that the astrologer had foretold the truth. The astrologer also added that the child should be named ‘Narottama’ for he would truly be the ‘best among human beings’. King Krishnananda celebrated the birth of his child with great pomp and show. Musicians were summoned and gifts were distributed in charity. The brahmanas came and chanted vedic hymns for the child’s well being. Six months passed swiftly and arrangements were made for the child’s grain ceremony. However, repeated attempts to feed rice to little Narottama failed. The child was not ready to accept these grains. An astrologer who was present over there then suggested that the child is fed with Krishna prasadam instead. In other words, the rice should be first offered to Lord Krishna before it was brought to the child. Accordingly, the rice was offered to the Lord and the remnants were then brought before the child. Narottama immediately accepted it and happily honored the Krishna prasadam. This pastime provided a glimpse of the glorious feats that Narottama would accomplish in his life. From that day onwards, King Krishnananda made necessary arrangements so that only foodstuffs first offered to Krishna, were fed to Narottama. At the age of five, Narottama had his ears pierced. Soon he began his education and within a short span of time achieved mastery over the various subjects. His brilliance and charming beauty delighted one and all. 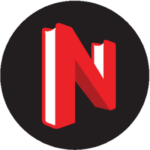 However being concerned with Narottama’s indifference towards material life, his parents began thinking about his marriage when he was just twelve years old. They thought that perhaps this was the best means of tying him down to family life. However, this alarmed Narottama and he decided to run away from his home. That very night, Narottama had a dream in which Lord Nityananda bestowed upon him His blissful darsana and reminded Narottama how he was living free of anxiety, completely forgetful of his eternal identity. He informed Narottama how he would fall into a great calamity in case he got married. He asked him to immediately go and bathe in the Padmavati river and assured him that he would receive everything over there. The pure love of God was preserved by Lord Caitanya Mahaprabhu in the waters of Padmavati. But this love could only be obtained by the mercy of Lord Nityananda. It is Lord Nityananda who is in charge of distributing this pure love of God (Prema) to one and all. Hence Nitai blessed Narottama and asked him to grab the mercy. Narottama woke up, and without informing anything to anyone, immediately started for the river. Chanting the holy name of Lord Gauranga, he entered into her waters. As soon as his body touched the waters of Padmavati, she was overcome with immense ecstasy, and her water swelled in all directions. Remembering Mahaprabhu’s instructions, Padmavati immediately delivered the treasure of pure ecstatic love of God, that she had preserved so dearly for so long, unto Narottama. Padmavati related to Narottama about how Lord Caitanya had saved this love for him in her waters and how she was asked to deliver it to him at the appropriate time. As soon as Narottama drank the water, his bodily complexion changed and assumed a golden hue. Being overwhelmed with a pure love of God, he began to laugh, cry and dance in utter ecstasy. His hairs stood at their ends and he constantly chanted ‘Gauranga! Gauranga!’. Meanwhile, his parents, not finding him in his room, started searching for him. Arriving on the bank of Padmavati, they saw Narottama but could not recognize him due to his transformed complexion. Finally, Narottama revealed to them as their dear son and accompanied them back to his residence. Day by day, the intensity of Narottama’s love for God kept increasing. He considered himself the most unfortunate for not having witnessed the pastimes of Lord Gaurahari with his own eyes. He lamented bitterly and cried incessantly feeling separation from His beloved Lord. One night Mahaprabhu appeared in his dream and instructed him to immediately travel to Vrindavana and accept initiation from Sri Lokanath Goswami. After this, Narottama just kept searching for an opportune moment to escape to Vrindavana. One day, avoiding everyone’s attention, feeling an insatiable urge to serve the Lord and dedicate his life completely, Narottama escaped from his home for Vrindavana. Being completely devoid of external circumstances, completely forgetting his princely stature, Narottama began his journey barefooted.He walked continuously for fifteen days, going without food and water at times. Only waves of love continued to flood his heart and mind. One day, while he rested beneath a tree, a golden complexioned boy appeared in his dream and delivered unto him a pot of milk. 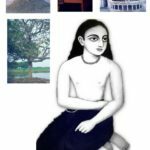 The boy told Narottama that if he drank that milk, then all his fatigue and pain shall disappear and it would become easy for him to travel to Vrindavana. Saying this the boy left. Then Sri Rupa and Sanatana Goswami also appeared in his dream and requested him to drink that milk. They exclaimed that Lord Caitanya had Himself brought that milk for Narottama. Narottama woke up and cried pitiably feeling separation from Lord Gauranga, Rupa and Sanatana. Feeling compassionate upon Narottama, Sri Rupa and Sanatana appeared before him and gave him their blissful darsana. They instructed Narottama to inundate the whole world with the ecstatic love that Mahaprabhu had saved for him. They blessed Narottama by placing their lotus feet upon his head before departing. Narottama continued on his journey and soon reached the precincts of Sri Vrindavana dham. Meanwhile, Sri Rupa Goswami appeared in Jiva Goswami’s dream and informed him of Narottama’s imminent arrival in Vrindavana. He ordered Jiva Goswami to ensure that Narottama was handed over to Lokanath Goswami. Accordingly, Sri Jiva sent messengers and escorted Narottama to Lokanath Goswami. Sri Jiva Goswami highly praised Narottama’s devotional sentiments and was amazed to note how detached he had become at such an early age. When Narottama saw Sri Govinda dev jiu in Vrindavana, he fainted in ecstasy. Sri Lokanath Goswami then touched him and receiving the touch of his eternal spiritual master, Narottama regained his senses. Lokanath Goswami expressed how Mahaprabhu had appeared in his dream and informed him of Narottama’s arrival. Both of them then honored Govinda jiu’s prasadam. Finding the opportune moment, Narottama disclosed his desire to take initiation from Sri Lokanath Goswami. But Lokanath Goswami refused. Sri Lokanath explained how a spiritual master should test his disciple for one full year before giving him initiation. A sincere disciple should also examine his spiritual master for one year, just to appreciate his glories. Saying this, he instructed Narottama to chant the Hare Krishna Mahamantra every day. 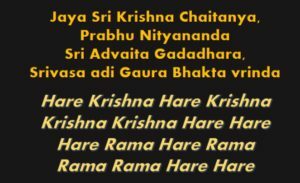 Krishna’s names are very powerful, he explained. If one develops an attachment to chanting, he shall quickly attain all perfection. Narottama chanted the Hare Krishna Mahamantra day and night. He chanted 1,00,000 holy names a day and sometimes chanted even more. Every morning he would visit Sri Lokanath and look at his beautiful features with undivided attention. He would obediently carry out his orders and honor his remnants. Lokanatha Goswami was Narottama’s life and soul. Besides this, Narottama also performed a special service for Sri Lokanath Goswami. Every day, He used to personally clean the place where Sri Lokanath used to pass his stool and urine. But Sri Lokanath was greatly perplexed as he wondered who could possibly perform this menial service for him. One year passed swiftly and Narottama continued with his daily services. In order to find out who was cleaning his ablutions, Sri Lokanath woke up early one day and went and hid at that place to see for himself. To his surprise, he saw Narottama standing there with a broom in his hand. He came out and immediately ordered Narottama to stop his service. He understood that Narottama had been cleaning that place and performing this service for so long. Sri Lokanath Goswami’s heart melted and he subsequently accepted Narottama as his disciple. On the auspicious tithi of Sravana Purnima, he initiated Narottama. The dedication and determination that Narottama possessed to obtain the shelter of his spiritual master are glorified in the pages of Gaudiya history till this day. His royal past and princely stature could not sway him from offering such a menial service to his spiritual master. Narottama das Thakura sought the blessings and instructions of Lokanath Goswami and served him faithfully. Later being instructed by his spiritual master, he obtained tutelage under Sri Jiva Goswami as well. In a short span of time, he obtained mastery over the various scriptures. He used to chant 1,00,000 holy names of Lord Krishna every day. There is a wonderful pastime that took place during his stay in Vrindavana. Srimati Radharani appeared in Narottama Thakura’s dream one day and glorified his qualities of doing Manasa seva (serving with one’s own mind). 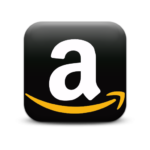 She exclaimed how She was exceedingly pleased with his services and was greatly impressed by seeing Narottama’s faith and devotion towards his Gurudeva. Srimati Radharani informed Narottama that Krishna was supposed to meet her for lunch that day. Hence, She along with Her Gopis had planned to make some sweet rice for Krishna’s pleasure. She added that one of Her gopis, Champakalata, was in charge of this service. However, Radharani wanted Narottama to assist Champakalata and boil the milk for her. Srimati Radhika revealed that boiling milk for the pleasure of Sri Radha and Krishna was Narottama’s eternal service in Vrindavana. In that dream, She also revealed Narottama’s spiritual identity as Champaka Manjari. Just to clarify at this point, that this dream that Narottama das Thakura saw was actually a glimpse of the eternal transcendental pastimes that are continuously being enacted in the holy dham of Vrindavana. The divine couple, Sri Radha and Krishna, though invisible to our naked eyes, are forever engaged in sporting pastimes over there, along with their intimate associates. Only the most fortunate souls, who have somehow gained their causeless mercy, are able to see or relish these Leelas or sometimes even participate in them. Gaining an entrance into these eternal pastimes of Vrindavana, however, is the ultimate goal in the life of a sadhaka (spiritual practitioner). Sri Lokanath Goswami and Jiva Goswami were greatly overwhelmed when they came to know about how Narottama had received the causeless mercy and instructions from Vrindavaneshwari, Srimati Radharani Herself. Lokanath Goswami blessed Narottama and inspired him to continue with his services. So one day, when Narottama was enraptured in his meditation and was boiling milk for the divine couple, the milk suddenly began boiling over. Narottama was boiling the milk on a stove that used firewood. The wood being dry, blazed brightly, causing the milk to boil quicker than usual. Running out of options, Narottama quickly lifted the hot pot from the stove and placed it outside the burner. But his fingers were burnt in the process. When his mediation broke and he returned to his external consciousness, Narottama noticed that his actual physical fingers were also burnt and they were hurting. So from this pastime, we can understand, that these services that Sri Narottama performed mentally were all real and impacting. They were not merely figments of one’s imagination. When Sri Jiva Goswami and Lokanath Goswami came to know how Narottama had burnt his fingers, they became overwhelmed with transcendental ecstasy. Appreciating his exalted stature and his intense devotional qualities, Sri Jiva Goswami conferred Narottama with the title ‘Thakura Mahasaya’. From Nityananda Das’ Prema Vilasa, we come to understand, that it was Sri Caitanya Mahaprabhu’s earnest desire that the books written by the Goswamis, be brought from Vrindavana and studied in Bengal because Bengal was very dear to Him. He wanted all these books to be translated in Bengali so that they could be relished by the Bengali devotees and enable them to further His mission. Also, there is another pastime in which the deity of Sri Govinda Dev jiu in Vrindavana personally spoke and instructed Sri Jiva and Srinivasa Acharya to distribute these books. Thus, Sri Jiva Goswami requested Sri Srinivasa Acharya, Narottama Das Thakura, and Syamananda Pandita (refer – ‘Sri Syamananda Pandita’s Bhajana Kutira & Samadhi, Kanupur (Near Balasore)’) to carry all these priceless books from Vrindavan to Bengal. After taking due permission from the senior Goswamis and their worshipable deities, the three of them set out for Gaudadesha (Bengal), carrying the treasure of these transcendental books. The books were loaded into huge trunks, which were then locked and securely placed upon a bullock cart. Sri Jiva Goswami then gave the three enough money and men to accompany them during the journey. They travelled all the way from Vrindavana to Bengal, taking the path through the Jharikhanda forest. Tears filled their eyes and ecstatic symptoms appeared on their bodies just remembering how Sri Caitanya had taken the same route while travelling to Bengal from Vrindavana. During nights, they halted at suitable places to rest and continued from there the next morning. Soon the bullock cart entered Bengal, and reached the borders of Bishnupur. But Sri Gauranga had other plans. An incident then took place which not only shook the three devotees carrying these books but also the entire devotee fraternity from Vraja to Bengal. King Bir Hambir, the King of Bishnupur, had a renowned astrologer in his palace, whose calculations were unmistakable. 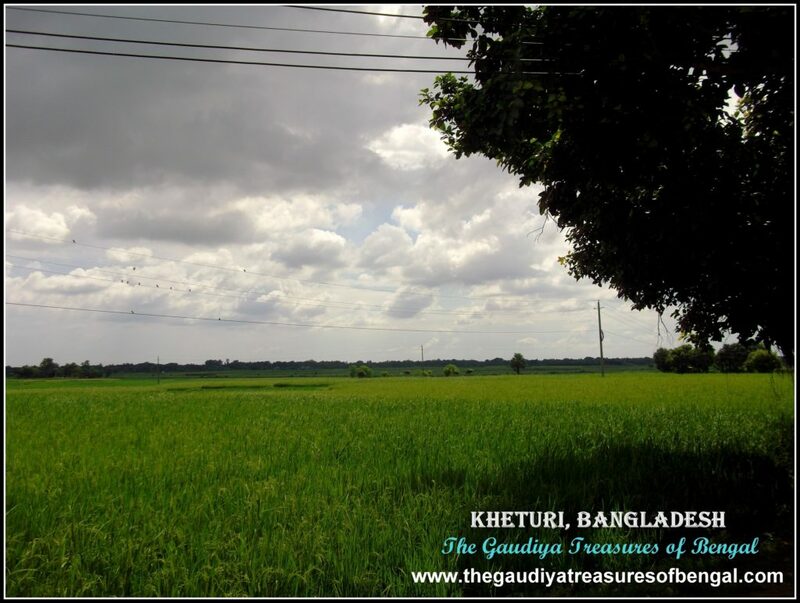 One day he informed the king that soon a bullock cart would be passing by the borders of Bishnupur, possessing some priceless treasures, which would herald a golden age for his kingdom. King Bir Hambir needed a lot of wealth to rebuild his kingdom after the wars, and hence he ordered his soldiers, to hide near the borders and watch out for the bullock cart. He strictly ordered that no one should be getting hurt and the wealth had to be captured without shedding even a single drop of blood. The soldiers complied and the huge trunks in the bullock cart were subsequently stolen and brought to the King. The soldiers informed him that the looted bullock cart had arrived from Vrindavana. When the trunks were opened, Bir Hambir was utterly confused and could not fathom why someone would take the pains to travel all the way from Vrindavana to Bengal carrying just a few books. Anyways, he ordered the trunks to be placed in the storeroom. The books that were stolen constituted the very pillars of our sampradaya, the very essence of Sri Caitanya Mahaprabhu’s movement, that have taken years for our dear Goswamis to compose. 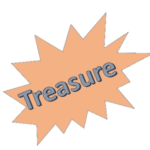 Srinivasa Acharya, Narottama Das, and Syamananda Prabhu wandered from village to village like madmen searching for the stolen books. They didn’t want to maintain their lives after this catastrophe. The stolen books included gems like Bhakti Rasamrita Sindhu, Ujjvala Nilamani, Vidagdha Madhava, Lalita Madhava, Hari Bhakti Vilasa, Sat sandarbha and Sri Caitanya Caritamrta. Sri Srinivasa Acharya then wrote a detailed letter to Sri Jiva Goswami describing the entire incident. When the news reached Vrindavana, all the Goswamis lamented bitterly and wanted to give up their lives. Sri Srinivasa Acharya then started meditating upon the lotus feet of Sri Gauranga and Nityananda, in order to seek guidance and instructions. Then one night, he asked Sri Narottama Das Thakura and Sri Syamananda Pandita to return to their respective homes in Kheturi and Orissa. Srinivasa Acharya decided to stay back at Bishnupur, hoping to recover these stolen books. What followed is a hair raising pastime. Srinivasa Acharya finally recovered these priceless books from the palace of the king. Not only that, but he also initiated Bir Hambir, the king of Bishnupur, who then went onto become a great Gaudiya Vaishnava devotee. How Srinivasa subsequently recovered these books and delivered the miscreants is a beautiful read. 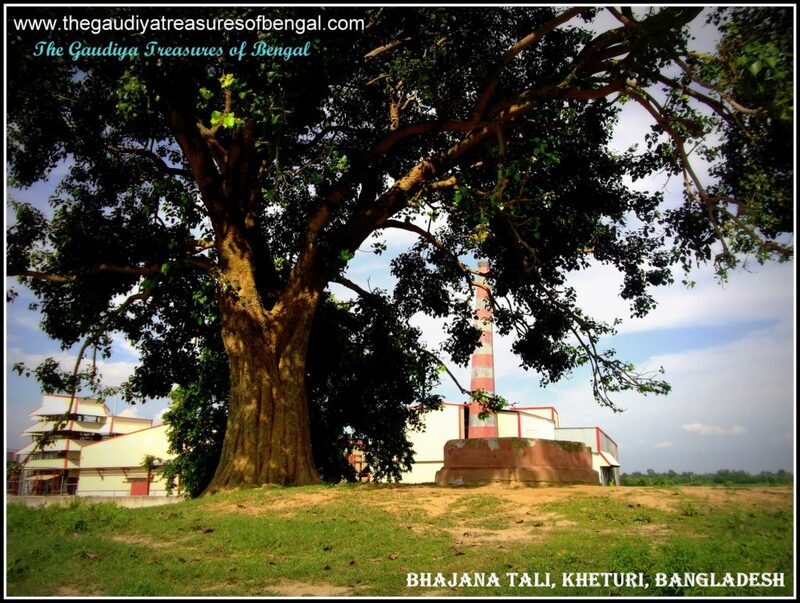 One can relish these heart-rending pastimes in the article entitled- ‘The Glories of Bishnupur (the temple town of Bengal) – Part 1 :Srinivasa Acharya and Bir Hambir’. Learning that Sri Srinivasa had successfully recovered the books, Narottama regained his very life. So he decided to, first of all, visit the various pastime places of Lord Caitanya before returning to Kheturi. He visited the various holy dhams and sought blessings of the senior Vaishnavas. Narottama das Thakura visited Mayapur and Navadvipa where he met with Isana Thakura, Suklambara Brahmachari, Srivasa Pandita’s brothers, and many others. 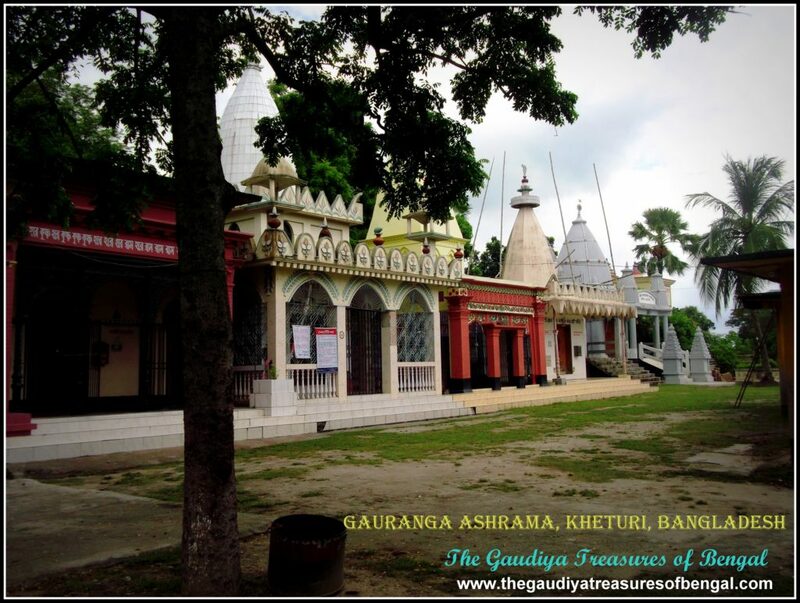 Visiting Ambika Kalna, he sought blessings of Gaudidasa Pandita. When he visited Santipur, he met and exchanged greetings with Achyutananda, Sri Advaita acharya’s eldest son. He visited saptagram, Khardaha, Khanakul Krishnanagar, etc where he received blessings of Sri Uddharana Datta, Jahnava Mata, Birbhadra Goswami, Mahesh Pandita, Parameswari das Thakura, and several senior Vaishnavas. After this he visited the holy pastime places of Jagannatha puri and met with devotees like Gopinath acharya, Kanai Thakura, etc. Returning back to bengal, he visited Srikhanda, Jajigram, katwa, etc where he received the opportunity to meet with Raghunandana, Srinivasa acharya, and other exalted devotees. Finally he returned to his hometown at Kheturi. His parents as if recovered their lost lives, seeing their son after so long. On the orders of Lokanath Goswami, Narottama desired to establish the worship of six deities at Kheturi and propagate the sankirtana movement of Lord Gauranga far and wide. The names of these deities were revealed to him in his dream. 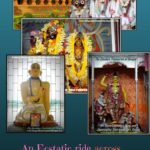 They were – Sri Gauranga, Vallavikanta, Sri Vrajamohana, Sri Krishna, Sri Radhakanta and Sri Radha Ramana. There is a very interesting pastime regarding how Narottama das Thakura discovered his Gaura Vishnupriya deities. In the province of Gopalpur, there lived a pious brahmana whose name was Bipradasa. Mahaprabhu revealed to Narottama das Thakura in his dream one night that his beloved Gaura Vishnupriya deities were presently resting at the house of this brahmana. These deities laid hidden in his huge container of paddy. Actually, when Mahaprabhu left Bengal for Puri, after accepting His sannyasa initiation, He manifested these enchanting deities and hid it inside the Ganges. In the course of time, they landed up in the house of this brahmana, but this brahmana was completely unaware of this fact. So when Narottama das Thakura arrived at the house of this brahmana the next day and wanted to look into his huge mound of paddy, the brahmana warned him that a huge venomous snake lived in it and it was not safe to go near it. Regardless, Sri Narottama entered the paddy container, and immediately the huge snake appeared and walked out of the mound. All present were very filled with wonder. Soon Thakura Mahasaya discovered his beloved Gaura Vishnupriya deities from the paddy and grabbed them dearly. The onlookers began loudly glorifying Narottama das and shouted Haribol! Haribol ! in ecstasy. 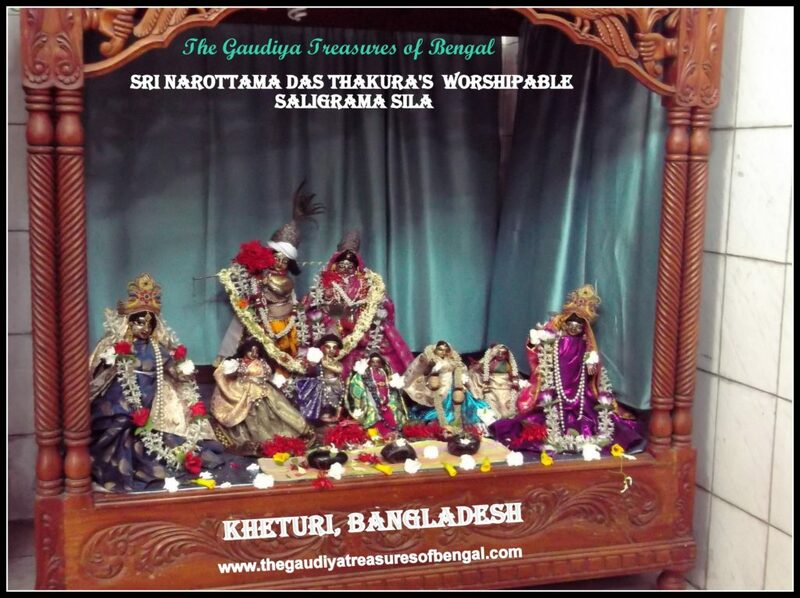 Narottama das Thakura wished to inaugurate his six deities on the auspicious occasion of Gaura Purnima. He desired to arrange a grand festival at Kheturi to celebrate this occasion with great pomp and show. Narottama das Thakura’s brother, Sri Santosh Datta, was also a devout Vaishnava and had inherited the kingdom from his father, Sri Krishnananda. Accordingly, as per the instructions of his brother, Santosh began making all the necessary arrangements. He ordered for the construction of temples at Kheturi, where these six deities would subsequently be installed. Sri Narottama das Thakura personally invited Srimati Jahnava Mata, Sri Srinivasa Acharya, Ramachandra kaviraj, and several stalwart Vaishnavas to attend the festival at Kheturi. During this grand festival that took place 500 years ago, gaudiya vaishnavas from all over India had come to participate. Sri Syamananda Pandita from Narsimhapur, Srimati Jahnava devi from Khardaha, Sri Parameswari das thakura,Srinivasa acharya along with his disciples, Krishnadasa sarkhel, Madhava acharya, Raghupati vaidya, Minaketan ramdas, Murari Caitanya das, Jnanadas, Mahidas, Sri Sankara, Kamalakara Pippalai, Gauranga Das, Bhagavatacharya, Sivananda sen, Nakari, Krishnadas, Damodara, Balaram Das, Mukunda das, Srila Vrindavana das Thakura, Achyutananda, Sri Krishna misra, Sri Gopala, Raghunandana, brothers of Srivasa Pandita and many others participated wholeheartedly. King Santosh Datta arranged for innumerable boats to carry the devotees to the other side of Padma. Numerous Bullock carts and palanquins were arranged to ensure that the devotees faced no problems reaching Kheturi. The whole atmosphere was surcharged with the mood of love and surrenderance. Narottama das Thakura, Santosh Datta, and Srinivasa Acharya personally welcomed the guests with Chandana and garlands. Rooms and servants were arranged for each of the guests. The dust of the feet of such exalted Vaishnavas transformed kheturi into an exalted place of pilgrimage. Loud reverberations of harinama sankirtana and the sound of the Mridanga and kartalas enraptured the sky. Not only the temples, but each and every house of the town was exquisitely decorated with banana leaves, auspicious pots ,articles, flowers, etc. Huge quantity of ghee, milk, vegetables and puja paraphernalia were arranged. Containers made of gold and silver were all kept handy. On the day before the festival, during the adhivasa ceremony, Sri Narottama das Thakura worshipped Jahnava Mata with Chandana and garlands. Thereafter all the other Vaishnavas were honored appropriately. Srimati Jahnava Devi was appointed the chief guest for the festival and Srinivasa Acharya was appointed the head priest. On the request of Sri Narottama and Srinivasa, Sri Raghunandana Thakura invoked the auspicious Mangacarana prayers. The sankirtana continued till late in the night after which the devotees accepted Prasada and rested for the night. The next day was the auspicious appearance day of Lord Caitanya. Since early morning, beautiful Harinama sankirtana filled the land, skies, and waters of Kheturi. Srinivasa Acharya performed abhisheka of the deities and then conducted the ‘Prana Pratishtha’ ceremony (breathing life into the deities). Various dancers and musicians from different parts of the country added melody to the already joyous surroundings. The deities were lavishly decorated and were offered innumerable foodstuffs which included various types of sweets, side dishes, pitha (a Bengali sweet delicacy), fruits, rice, etc. Jahnava Mata personally offered the bhoga unto the deities. Thereafter, arati of their Lordships was performed and the Mahaprasada remnants were distributed to the assembled devotees. On the orders of Jahnava Mata and Achyutananda, Narottama das Thakura then began his kirtana. Sri Gauranga das, Gokul das, and Sri Vallabha das assisted him. Sri Devi das was in charge of playing the mridanga. It is worthwhile mentioning at this point that Sri Narottama das Thakura had a unique style of singing bhajans which since became renowned as Garanhati. Sri Narottama das Thakura is renowned all over the three worlds for his bhajans. The songs contained in his book, ’Prarthana’ and ‘Prema Bhakti Chandrika’, are the treasured jewels of our Gaudiya sampradaya. Anyways, returning to our present discussion, the melodious bhajans of Narottama das Thakura overwhelmed the audience with waves of transcendental ecstasy. The devotees who were present sometimes laughed like madmen and at times shivered uncontrollably. Their lips trembled and the hairs on their bodies stood at their end. In this way, Narottama inundated the entire place with the love of God. All of a sudden, as the transcendental emotions reached their very peak, Lord Gauranga Sundara, along with His associates, appeared over there in the midst of the devotees. 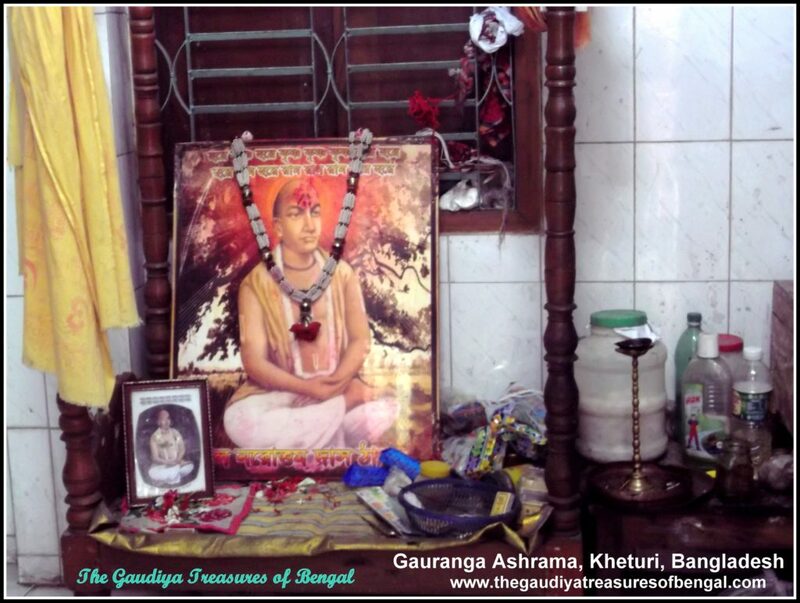 Lord Gauranga could not hold Himself back, hearing the stone melting bhajans of Narottama das. So though He had already wrapped up His earthly pastimes by then, He appeared over there at Kheturi just to shower His causeless blessings upon Narottama and the Kheturi Mahotsava. Just as a flash of lightning appears from within the dense clouds, similarly Lord Gauranga appeared in the midst of the ecstatic cloud of Harinama sankirtana. He was accompanied by His eternal associates like Narahari Sarkar, Sri Mukunda, Sri Gaudidasa, Sri Advaita, Nityananda, Madhava Ghosh, Vasudeva Ghosh, Govinda Ghosh, Purandara acharya, Mahesh Sankara, Sridhara, Jagadish Pandita, Yadunandana, Kashishwar Pandita and many others. All the devotees present over there at Kheturi joined Mahaprabhu and His associates in the most ecstatic dancing sankirtana ever seen on the face of this world. Manifesting His divine appearance along with His associates, Lord Caitanya fulfilled the desires of Srinivasa and Narottama. At the end of the sankirtana Lord Gaurahari and His associates disappeared from everyone’s sight. The devotees felt the bitter pain separating from the Lord of their lives once more. Sri Jahnava Mata then offered auspicious colors (abir) unto the deities. In the evening, the sankirtana resumed once more and it continued till late in the night. The next day Jahnava Mata cooked bhoga for the Lord. She personally served prasadam to all the devotees. Also, it was here at the Kheturi festival, that Srimati Jahnava Devi personally resolved the differences that existed within the conclusions of the various branches of our Gaudiya sampradaya. A few days on, the devotees began departing for their respective Sripats. With tearful eyes, King Santosh Datta, and Narottama bade their guests farewell. The King donated various items unto his guests in charity. The grand festival of Kheturi came to a conclusion and all the Vaishnavas wholeheartedly blessed Narottama das and his pious brother, King Santosh. Due to Sri Narottama das Thakura’s mercy, the sankirtana movement of Mahaprabhu spread far and wide. The heart-melting bhajans composed by Thakura Mahasaya became the very life and soul of the Gaudiya Vaishnavas. Thousands of people took his shelter and started relishing the sweet mellows of devotion. But the orthodox caste brahmanas became jealous observing the rise of the Bhakti cult. There was one such brahmana, who severely criticized Narottama das in front of his students, citing that Narottama was a mere shudra who was incapable of delivering anyone. As a consequence, this brahmana was afflicted with leprosy. Not being able to tolerate his pains any longer, the brahmana decided to commit suicide by jumping into the Ganges. That very night he saw a dream in which he was told that the reasons why he was suffering so much, was his criticism of Narottama das. The goddess revealed to the brahmana how he had offended a pure devotee of the Supreme Lord and how he had to suffer terribly for millions of births as a result. However, the goddess also informed that the brahmana could save himself from his situation if he begged forgiveness at the lotus feet of Narottama das. So the very next morning, this brahmana came crying to Narottama das Thakura and humbly fell at his lotus feet. When Narottama das Thakura forgave him, the brahmana was cured of his leprosy. Thakura Mahasaya advised him to practice Krishna bhajana. In this way, Sri Narottama das Thakura delivered innumerable fallen souls. Prominent among them were the two sons of Sivananda Acharya, the landlord of the nearby Goyas village. These two young brahmanas, Sri Harirama and Ramakrishna, were carrying goats and sheep, who were to be subsequently killed and offered unto goddess Durga. Obtaining the blissful darsana of Narottama and Ramachandra Kaviraja, they had a change of heart. They approached them and enquired regarding the absolute truth. They came to understand how sacrificing animals and partaking their remnants was nothing but worship in the mode of ignorance (which only leads one to hell) and how worship of Lord Krishna was the supreme conclusion of devotional science. They surrendered at the lotus feet of Narottama and accepted Krishna consciousness as their way of life. Harirama subsequently accepted Vaishnava initiation from Ramachandra Kaviraja and Ramakrishna obtained the same from Sri Narottama das Thakura. When their father, Sri Sivananda Acharya came to know about this, he became very angry. He appointed smarta brahmanas to counter the arguments of his sons. Sivananda wanted to prove that a brahmana was always on a higher platform compared to a Vaishnava and how sacrificing innocent animals for Goddess Durga was an ideal religious practice. Sri Harirama and Ramakrishna completely destroyed these silly arguments and explained how the spirit soul (Atma) was devoid of any external designations of caste and creed. The only function of the soul was to serve the Supersoul (Krishna) as per his limited capacity. A Vaishnava is one who acts on this spiritual reality and is to be considered higher than the brahmanas. A Vaishnava is completely transcendental to such material designations. Empowered by their spiritual master, the two also defeated the logic which professed the sacrifice of innocent animals unto the goddess. Sivananda then summoned a famous smarta brahmana from Mithila, whose name was Murari, to come and challenge his two sons. Murari was also soundly defeated and his false ego was shattered. When it was all over, the mahapandit fled the assembly in great embarrassment and accepted the occupation of a beggar. Goddess Durga appeared in Sivananda’s dream that night and revealed how Sri Vishnu was her master and the deliverer of one and all. One who has no respects for Sri Hari was a demon. The Goddess added that she destroys anyone who worships her but disregards Lord Vishnu. Sivananda acharya realized his mistake and begged forgiveness at the lotus feet of Narottama das Thakura. In the village of Gambhila, lived a learned scholar whose name was Ganga Narayana Chakravarti. He heard from the lips of Narottama Thakura the siddhantas of the Goswamis with great attention and took shelter of the lotus feet of Narottama where he later very deeply studied the scriptures of the Goswamis. There was another brahmana named Jagannath Acharya who was a worshipper of goddess Durga. One day in a dream Durga Devi appeared to him and said, “O you simple brahmana. Go to Narottama das Thakura. Take shelter of his lotus feet. Practice worshipping Krishna and you shall achieve the greatest fortune. Krishna is my master and my guru. Not a blade of grass moves without His wish.” Jagannath Acharya subsequently surrendered and accepted initiation from Narottama das Thakura. Seeing that thousands of people were accepting the shelter of Narottama das and embracing the Vaishnava way of life, the smarta brahmanas got roasted with envy. They went to King Narasingha and requested him to save the brahmana community. They objected that Narottama, in spite of being a member of the shudra caste, was initiating Brahmanas and accepting them as his disciples. On the suggestion of the Brahmanas, King Narasingha then called upon the great digvijayi Pandita, Sri Roop Narayan, and sought his help to defeat the philosophy of Narottama das. In this way, along with Raja Narasingha, the smarta panditas arrived in the marketplace of Kumarpur (near Murshidabad) and set up their camp near the shops. Ramachandra Kaviraja and Ganga Narayana Chakravarti came to know about this and hence they went and set up their shops in that market as well, disguising themselves as a potter and a betel leaf seller respectively. The King and His entourage were en route to Kheturi, the sripat of Narottama das, in order to challenge him. The disciples of the smarta brahmanas went for some shopping in the market and engaged in a conversation with Ramachandra kaviraja and Ganga Narayana Chakravarti. The smarta Brahmanas were surprised seeing the two speaking in Sanskrit. A philosophical debate ensued in which not only these smarta brahmanas but also the great Pandita, Roop Narayana was soundly defeated. Raja Narasingha made some inquiries and came to know that the betel leaf seller and the potter were friends and disciples of Narottama Das. At that time he said to the panditas that when they were unable to defeat followers of Narottama in the matter of scriptural conclusions, how can they defeat Narottama himself? Realizing their defeat the King and his panditas returned to their respective hometowns. That night King Narasingha and Pandita Roop Narayana witnessed a dream in which Devi Durga appeared and threatened to destroy them if they did not beg forgiveness at the lotus feet of Narottama das Thakura. Goddess Durga is a Vaishnavi herself and she cannot tolerate any offenses unto the pure devotees of Lord Krishna. The next morning King Narasingha and Roop Narayana surrendered unto the lotus feet of Narottama das Thakura and begged forgiveness for their offenses. They were overwhelmed with Narottama’s gentle and polite Vaishnava behavior. Soon Narottama initiated them and accepted them as his disciples. The preaching continued to spread like a wildfire all over India. It gradually even spread to the regions of Manipur and Tripura. Even the king of Manipur, King Bhagyachandra Singha, became a devout Vaishnava by the mercy of Narottama das Thakura. Sri Ganga Narayana Chakravarti, Sri Krishna Charana Chakravarti, Sri Rupa Paramananda Thakura, and several other exalted Vaishnava acharyas can be counted among the prominent disciples of Narottama das. 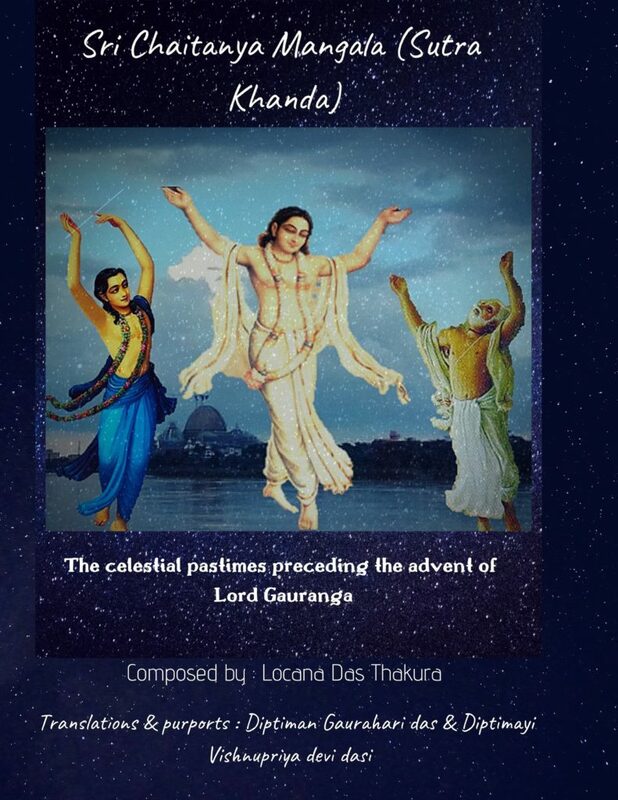 Narottama das Thakura was absorbed in singing the glories of Lord Gauranga and Nityananda day and night. By the mercy of his lotus feet, several atheists, agnostics, offenders, demigod worshippers, dry logicians, speculators, etc were delivered. Hearing the terrible news of the disappearance of Sri Ramachandra Kaviraja, who was his very dear friend, Narottama plunged into an ocean of grief. The spiritual master of Ramachandra, Sri Srinivasa Acharya, who was also a very dear friend of Narottama Thakura, soon passed away as well. Arriving at Gambhila, Narottama das Thakura ordered his disciples Sri Ramakrishna and Ganga Narayana Chakravarti to arrange for his bathing in the Padma. He entered the waters after repeatedly paying his obeisances. Standing there in the water, he then ordered his disciples to wipe his body. Then, as Ganga Narayana and Ramakrishna, were cleansing the body of their spiritual master, Sri Narottama merged into the waters of Padma and vanished from worldly view. His disappearance was just as milk vanishes in water. It is believed that Thakura Mahasaya wrapped up his earthly Leela and manifested his disappearance pastimes in the year 1611 AD. Sri Narottama das Thakura’s tirobhava is celebrated on the Kartiki Krishna Panchami tithi. A huge festival is held every year at Kheturi to commemorate the disappearance of Thakura Mahasaya. The birthplace and Sripat of Sri Narottama das Thakura – This is where the Kheturi Mahotsava had once taken place. There is a beautiful temple , renowned as Gauranga Ashrama, that stands at this site at present. The wars of the 1970s have ravaged this sacred dham and as a result Thakur Mahasaya’s worshipable deities are no longer to be found over here. However a few of his worshipable Saligrama silas are still preserved and worshipped here with due diligence. 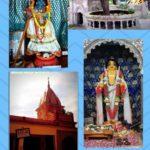 Premtali – This is where Thakura Mahasaya bathed in padma and received the treasure of love, that Mahaprabhu had saved for him. There is a small temple and an ancient Tamala tree located at this site. 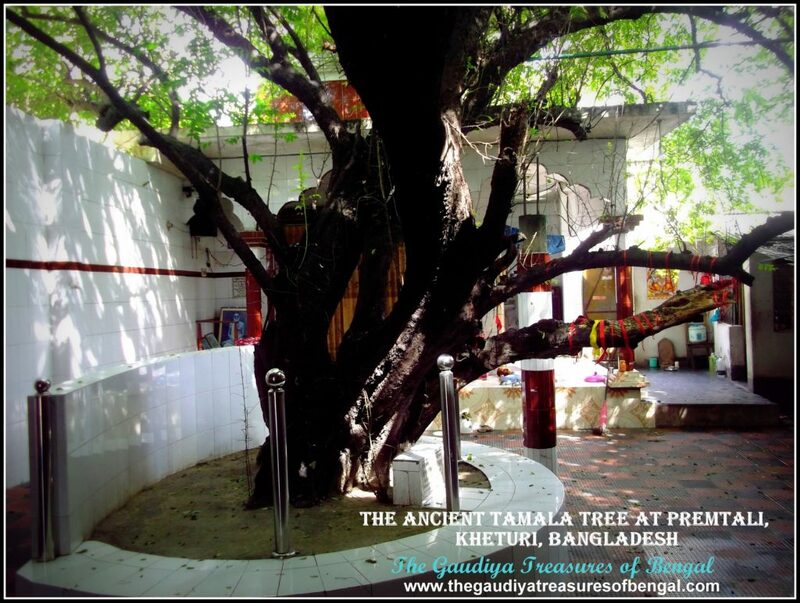 It was near this Tamal tree that Narottama das had bathed in sacred Padma. This Tamala tree is hence a witness to Narattoma’s ecstatic transformations. Bhajanatali – Not very far from Premtali, is the place where Narottama das Thakura used to mediate and compose his heart melting bhajans. It is believed that it was here at Bhajanatali that Thakura Mahasaya had composed his glorious compositions – Prarthana and Prema Bhakti Chandrika.As Narottama used to remain deeply engrossed in his meditation over here, this place is also known as Gupta Vrindavana. All that remains of this place is a raised platform in the middle of a huge field. A tall Aswatha (Ficus religiosa) tree provides shelter to this exalted Bhajanatali. Khilantali – There is a place nearby renowned as khilantali where it is believed that Thakura Mahasaya used to brush his teeth. Once after brushing, Narottama had planted the brushing stick into the ground which immediately blossomed into a beautiful mango tree replete with fruits. We worship the lotus feet of our spiritual master ,whose causeless mercy has empowered us ineligible fools ,to gain entrance and take up service in this exalted abode of Kheturi. We seek shelter of this holy land, and pray that its glories remain forever imprinted in our heart.‘The Gaudiya Treasures of Bengal’ offers millions of obeisances and humbly prays to Sri Narottama das Thakura that we advance in our Krishna consciousness, develop attachment unto the lotus feet of Lord Gauranga and are able to serve Sri Guru & Vaishnavas, by our honest and sincere efforts. We seek his blessings and compassion , in successfully rendering this humble service of reciting the pastimes and revealing the pastime places of the Supreme Lord and His beloved associates.We shall consider ourselves greatly fortunate and our existence meaningful if Lord Gaurahari and our dear spiritual master are kindly pleased with our endeavours. ‘The Gaudiya Treasures of Bengal’ has been striving to seek shelter of such great personalities throughout its spiritual journey. It is only with this objective of receiving their mercy and sharing it with others, that we have set out from our homes, trying to reveal to the world the mood and esoteric pastimes of these great men.The life and teachings, of these stalwarts inspire us to imbibe the same values and principles in our own lives and we pray that they mercifully bless us, so that we may forever contemplate upon their blissful pastimes. 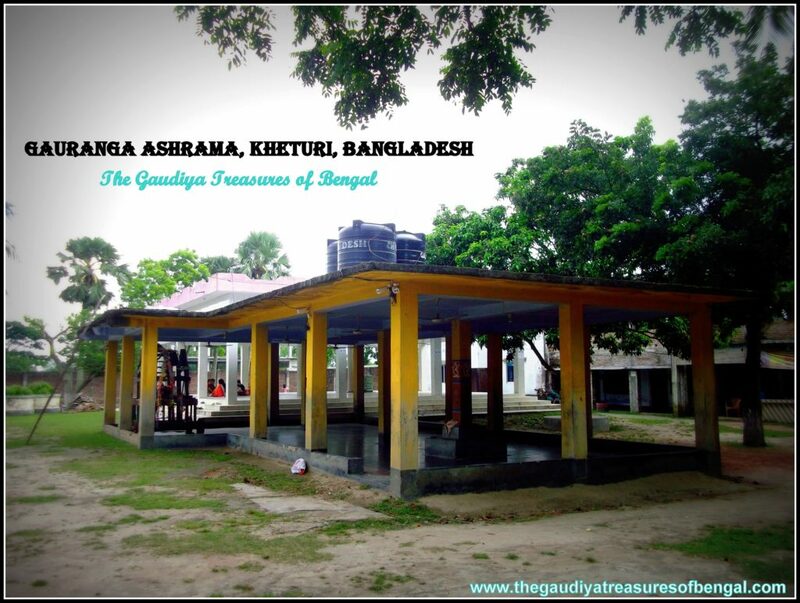 The Team from ‘The Gaudiya Treasures of Bengal’ had reached Rajshahi crossing over the Mahadipur (shona masjid) border to reach Bangladesh. For this purpose we had to stay in Malda for one night as the Mahadipur border is not very far from Malda town. It took approximately a couple of hours to complete the formalities of border crossing. Travelling through Rajshahi was an experience of a lifetime.The district of Rajshahi is mesmerizing, replete with natural treasures and picturesque appearances. The Sripat of Narottama das Thakura is approximately a half an hour ride from the Rajshahi city and approximately a couple of hours drive from the Mahadipur border crossing. This ancient place is completely untouched and kind of aloof from the ill effects of the modern civilization.The devotees of the dham received us cordially and showed us around the place. We also had the good fortune of honouring Prasadam at Kheturi. Though this place has been ravaged by several wars and several of its heritage structures have suffered serious damage, yet Kheturi remains one of the most spiritually significant. No matter what the land of Kheturi may seem to the material eyes, or our conditioned mind, the eternal pastimes of the Lord and His beloved associates are continually being enacted in this exalted abode. Accomodation – One can choose to stay at any of the prominent hotels in the Rajshahi city. 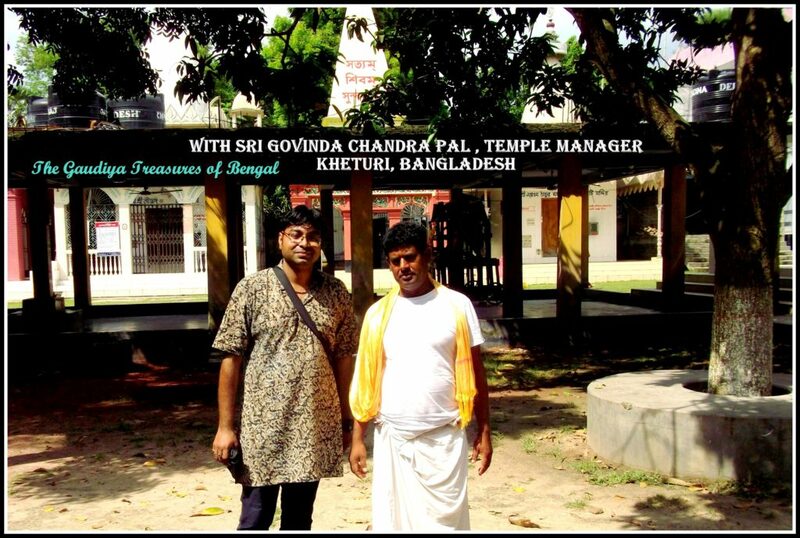 There is also an Iskcon center located in Rajshahi, where one can avail his prasadam. 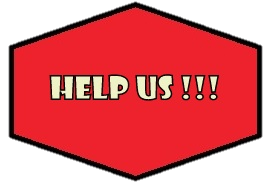 We are very grateful to our well-wishers ,especially Vishal Gandotra Prabhu and Jayadeva Das Prabhu (both residents of USA) ,for generously contributing and sponsoring our yatra to Kheturi. We pray for their spiritual well being and beg Thakura Mahasaya to shower his choicest blessings upon them.